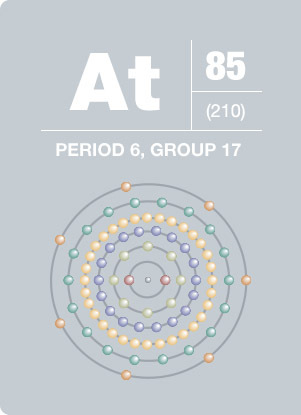 Astatine is the heaviest of the halogens and is essentially unavailable in nature with less than one teaspoon of the element found in the Earth’s crust at any one time. In 1940, D. R. Corson, K.R. MacKenzie, and Emilio Segre of the University of California, Berkeley discovered that the only possible way of producing astatine is by bombarding bismuth with energetic alpha particles. Similar to the metallic element iodine, astatine accumulates in the thyroid gland.